The lineage of Shaolin Temple is long and illustrious. Many are already familiar with Shaolin's earliest notable monks such as Ta Mo, and perhaps his disciple Hui Ke or Shaolin's first abbot Ba Tuo. There are many more eminent monks throughout Shaolin Temple's 1,500 years of history. Some of this research was translated from Monk Shi Deqian's unprecedented four-volume masterpiece, Shaolin Temple Wushu Bai Ke Qian Shu (encyclopedia) in which he outlined much of Shaolin's history. Additionally we have included supplementary research to help better explain this subject to the Western reader. 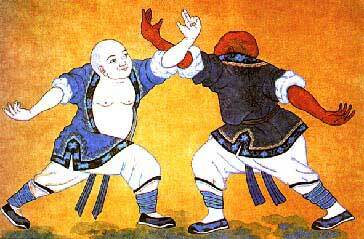 The first abbot of Shaolin Temple was an Indian monk named Ba Tuo. In fact the Shaolin Temple was erected for this monk. The construction of the temple was begun by Emperor Wudi (439-493) and it was completed by Emperor Mingdi (447-498). The Qi dynasty (470-502) had a short-lived reign during the chaotic southern dynasty period. However, they were fervent supporters of Buddhism and built two of China's most famous Buddhist caves. Emperor Wudi began the caves at Yungang, and Emperor Mingdi began the work at Longmen, near Shaolin. It took three years of working day and night to build the Shaolin Temple. It officially opened on May 23rd, 495 CE. Pu Ti Ta Mo (378-?) is a phonetic translation of his Indian name Bodhidharma. He developed the first exercises that became the basis for Shaolin Kung Fu and he was the founder of Chan Buddhism. When Ta Mo finally accepted Shin Huang as his disciple he gave him the name Tai Tsu Hui Ke (potential for Dharma). He eventually passed on his robe and bowl to signify Hui Ke's succession. After Hui Ke himself passed on the Dharma to his successor and left Shaolin, he confessed that he still owed some Karma from his former lives, and "concealed the light." He mixed with commoners, entered wine shops, and cleaned outhouses, but maintained a following. The Lineage of the Shaolin Temple was overshadowed by events in Chinese Chan Buddhism. To understand Shaolin, we must examine the Chan lineage for a few more generations. The third patriarch of Chan was Chien Chi Seng Tsan (also spelled Sheng San, 520-612). He was a leper that was cured by his Buddhist practice after meeting Hui Ke. His name means "Mirror-like Wisdom, Community Jewel." During this time, Buddhists were being persecuted by Emperor Wu of the Zhou dynasty (557-581) for being "foreign" in nature. Sheng San disguised himself and went into hiding in the mountains. The fourth patriarch of Chan was Dai Dao Xin (also spelled Gao Xing, 580-651). His name means "Great Physician." He always sat in meditation, not even lying down to sleep for sixty years. He even "died in state", meaning he passed away in meditation. Ta Man Hung Jen (600-674) was the fifth patriarch of Chan. His story is very unusual. An old seeker asked Gao Xing to learn the Dharma, but the master refused him saying he was too old. He told him to come again in the next life and he would wait for him. The seeker later met a young girl by the river and spent the night. She became pregnant and was disowned by her family. In desperation she abandoned the baby son by the river, but spirits in the form of two birds and two dogs protected him for seven days. When the baby survived, the mother took him back and he was called "nameless child". Seven years later, Gao Xing found the boy, and passed his robe and bowl to the child. Hung Jen also died in state. The sixth patriarch, Ta Chien Hui Neng (638-713) is one of the most influential figures of Chan Buddhism, despite being illiterate by some accounts. Hui Neng's dharma talks were recorded as the Platform Sutra of the Sixth Patriarch, and are studied and revered to this day. During this time, the robe and bowl of the patriarchs had become coveted objects, so Hung Jen passed them on to Hui Neng in secret. He told Hui Neng to go into hiding, since it was said that the life of the bearer of the robe and bowl "hung by a threat". He eventually passed the robe and bowl on to the seventh patriarch Hsing Su, but the Chan school lineage grew apart. Today Hui Neng is considered the sixth and last abbot of Ta Mo's direct lineage at the temple. For reasons that will soon become apparent, the Shaolin Temple acknowledges these various branches of the tree of Chan. Beyond Hui Neng's Chan branch, two other monks are acknowledged as 6th generation. Shen Hsui (606-706), who lost a poetry writing contest and consequently the lineage to Hui Neng, headed the northern Chan branch. Another monk Fa Ru (637-689) is also mentioned but little is known about him. Monks Shen Hui (668-760) who documented the life of Hui Neng and who is possibly responsible for much of his platform sutra, and Pu Ji are recognized as 7th generation. During this period Chinese Chan Buddhism formed five major branches, which are also called the Five Chan Families. These branches are different from the five major branches of Buddhism of which Chan is one. Monk Ben Ji created Seng Zhong Lingji Zong by combining the teaching of another monk called Liang Jie with his own traditions. Monk Yi Xuan founded Chan Zhong Lingji Zong at Lingji Temple in Hebei. Monk Wen Yen went to Luyen in Guangdong and he was a proponent of Chan Zhong Yuan Men Zong. Monk Hui Ji believed that everything has feelings and can find their inner Buddha by clearing their heart. He established Chan Zhong Wei Yan Zong at Yan Mountain. Lastly, monk Wen Yi developed Chan Zhong Fa Yen Zong after his moniker Da Fa Yen Chan Si ("he who can see through everything"). Many of these secular Chan branches were obliterated during the Tang dynasty persecution of Buddhism (842-845). Centuries later at the Shaolin Temple, being the root of these five Chan branches had its price. Turmoil had caused riots that resulted in the burning of the entire temple. It would not be the last time the temple was burned. During this time a very special child was born to the Zhang family in Shuiwen county in Shanxi. His nickname was Sen Xiao Er ("little kid saint") because he could read a book just once and have a complete understanding of it. He renounced the world for monkhood, took the name Fu Yue and began training under monk Xiu Lin. When he came of age, First Yuan (Mongol) Emperor Shizu, better known as Kublai Khan (1279-1294) sent him to Shaolin to restore order.